I think it’s safe to say this may be the geekiest project I’ve done to date. 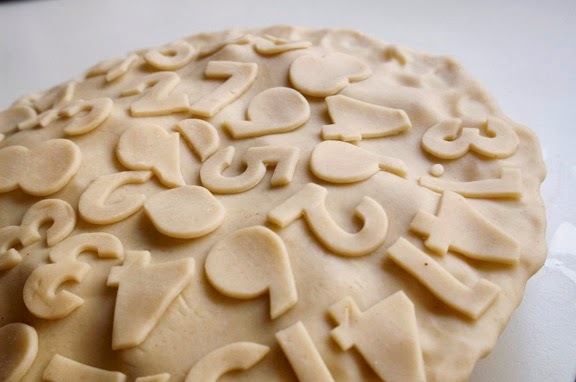 And that’s saying something, I mean, it’s a pie made entirely of apple numbers. And then topped with more numbers, this time of the crust variety. Oh, and not only numbers, you see, but the numbers of that beloved symbol of Nerdland (and I mean that in a good way), Pi. What a major motion picture production this thing was, although I should say I really expected it to take longer than it actually did. I’ve never even been that great at peeling and coring, much less cutting out shapes from apple slices (or letters/numbers period), so I prepared for the worst. I bought about 6 million apples, just in case. I had lemons and 7Up on standby (my grandmom secret for keeping apples from going brown) and I had the sugar/spice filling mixed. Because apples can be so supremely fussy (and I know this from making a strudel a while ago) that once you start peeling, you can’t stop until the pie is like, in the oven. So: If you would like to be amazingly nerdy and attempt this pie, I’m going to dispense with the storytelling and skip right to the tips and suggestions. If you want to make a normal apple pie, this is a great recipe. It’s a sturdy, straightforward, classic pie with a simple filling. Super-delicious. Pi Pie: Tips + Suggestions. 1. The assembly line method is the way to go. I feel strongly that doing tasks this way makes things go faster because it allows you to get in a little zone with whatever it is you’re doing. Don’t try to peel a few apples, then stop and do coring, or take a little break to cut a few out. Do all the peeling, then all the coring, etc. You may start off slow, but you’ll be processing those apples faster than a Martha Stewart intern in no time. 2. Just say no to brown apples. I already gave you the first tip, really, but make sure you’re prepared to house your number cutouts in a shallow baking dish and in a pool of lemon lime soda and some lemon juice. The soda keeps it from getting to lemony, and the juice does the heavy lifting. Don’t douse them…think rain puddle. I sprayed mine with the occasional spritz of lemon juice so I didn’t have to jostle them. 3. 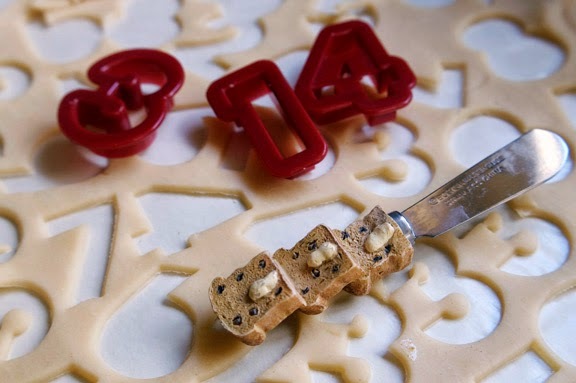 Use cheap plastic cookie cutters. Do you know where these numbers came from? Some big box of assorted plastic cutters I purchased from target maybe a year ago. One of my most valuable cheap purchases to date; anytime I need a random shape or thing, it’s magically in there. And they worked great for cutting through the apples. If you have metal ones, that probably works well too. 4. Don’t toss those numbers. Seriously, unless you want to undo the hard work you’ve done, you won’t just shovel them around in the brown sugar/cinnamon filling with a spoon. As they were already laying in my baking dish, I carefully drained out the excess soda/lemon liquid and poured in my filling mix. Then, working slowly, I used my hands to basically massage the filling into and on top of the numbers. You just want to evenly distribute the filling throughout. 5. Store-bought pie crusts are your best friends. Before you even think to ask, no: that is absolutely not even close to being a scratch pie crust. Thank you for thinking I’m that patient and could take the time to fool with a scratch pie crust while cutting apple numbers, but let’s get real. That is a perfectly lovely, no-roll, no-mess, no-floury surface, store-bought pie crust. If I were making a normal pie, I would have tried the scratch crust. This is not that pie. Besides, I used two whole crusts for the top and bottom of the pie, plus one additional crust for the cutout numbers on top. Buy two boxes and you’ll be left with one extra you can use later. 6. Butter spreaders are great all-purpose tools. See that there? That’s one of my many butter spreaders. This one, in particular, is a raisin toast variety. You do not need to use a raisin toast spreader, but you should buy these things when you see them; they come in handy for everything from picking the little apple bits that get stuck in your cutters to loosening the crust numbers off your cutting surface. 7. Work slowly and gently. When you’re ready to fill the pie, gently slide the numbers from the baking dish into the pie. 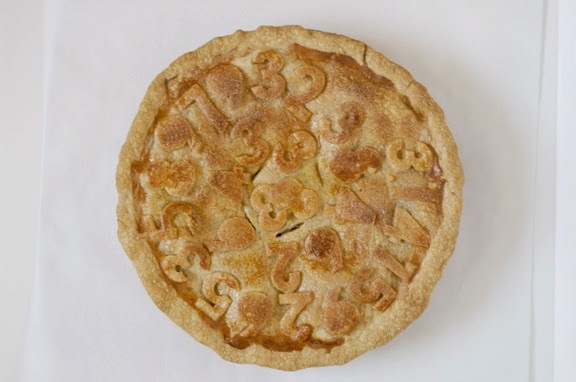 Cover the pie, do your cutout crust numbers, and gently place them on the top. When it’s time for the egg wash, take your fingers and gently press down on the numbers you’re washing to hold them in place while you brush over them. Just don’t rush it. by now, you’ve put in far too much work to ruin it by speeding along. Your oven will wait. 8. Make pie hats. As you can see, mine got a little dark around a part of the edge there. I think my pie hat was off-kilter a bit. But the rest of my pie emerged unburned and nicely golden, which is a direct result of the pie hat I fashioned from aluminium foil. To make, just take a few short pieces of foil and shape them so it makes a circle big enough to cover the edges. After about 20 minutes in there, you’ll want to watch your pie, adding the pie hat when necessary. I had an additional flat piece of foil handy in case the top started to get too brown before the insides were bubbly. And there you have it; The Pi Pie Instruction Manual. Is it ridiculous? Yes. Is it a little fun? Yes. Would I do it again? Perhaps; I like the idea of cutting apples into shapes, and it’s not hard, so I would consider doing maybe a lattice pie so you could see the filling. Or a crumble. 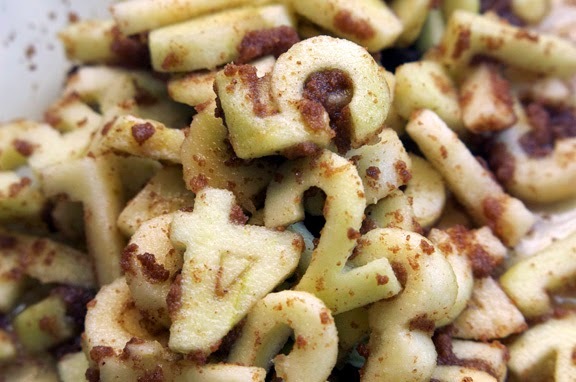 Maybe even use letters, or different cutters small enough to fit the apple slices. We’ll see. So let’s all cross our fingers and maybe I’ll be a finalist. Maybe I’ll even win. Honestly, even if I don’t get either, I had a great time. And, hey, I’ve got a pie sitting in my kitchen for no reason. Adapted from Williams Sonoma’s Essentials of Baking: Recipes and Techniques for Successful Home Baking. Note: If you are making the pi pie shown above, I want you to double everything listed under the “for the insides” section. You need twice the apples because the cutout apples don’t yield as much as a regular slice-and-dice would. You need twice the filling because you have to be gentle, and gentle involves you making double the amount of filling and then pouring it on in sections, as needed, until it is mixed. You’ll have some left over, and that’s ok. Remember: if you’re doing the Pi pie, please look at my tips above, because the recipe gets too confusing if i go back and forth about the tips for regular versus pi version. Or if you have a specific question i didn’t answer above, please don’t hesitate to post your question and i’ll be happy to answer it. 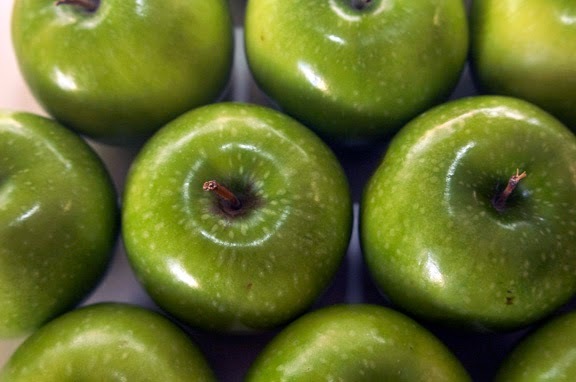 to make the filling, peel, halve, and core the apples, then slice the apples 1/4 inch thick. 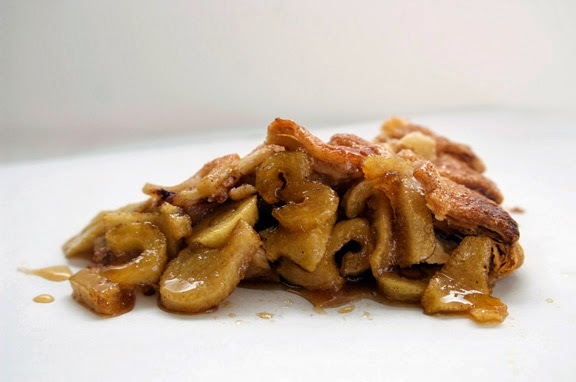 In a large bowl, combine the apples, lemon juice, melted butter, brown sugar, cinnamon, and nutmeg. Using a large spoon, stir until blended. Set the filling aside. Position a rack in the lower third of the oven, and preheat to 400˚F. Roll out the 2 crusts (and by “roll,” I mean unroll them from their packages) and line a 9-inch pie pan with the bottom crust, pressing firmly so crust is smooth against your pan. Stir the apple mixture again to get the juices incorporated, spoon it gently into the crust, and smooth the apples into an even layer. Position the top crust over the filling and trim and flute the edges. I did a simple edge; you do it how you wish. Mix your beaten egg with your heavy cream and whip together until incorporated. Using a pastry brush, brush the top of the pie with the egg mixture, being careful not to brush the edges. You won’t need nearly all of the egg mixture, so don’t feel bad if you have some left over. Mix together the cinnamon and sugar and sprinkle over the top. Cut 3-4 steam vents in the top of the crust. Bake the pie for 15 minutes (did you position your rack to the lower third of the oven? Hope so. If you didn’t, do it before the pie gets in there). 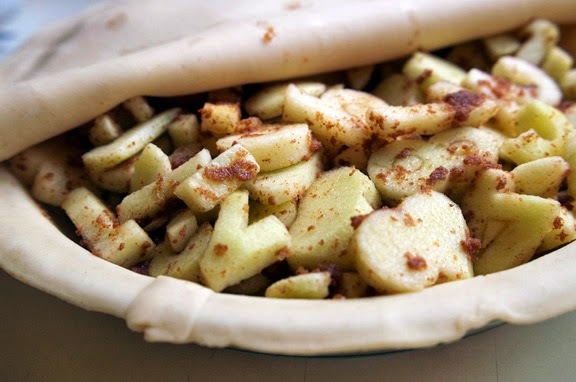 When your 15 minutes has passed, reduce the temperature of your oven to 350˚F and bake until the top crust is lightly browned, the apple filling is bubbling, and the apples ar tender when tested through the slit in the crust with a toothpick, about 40-45 minutes. Note: about 20 or so minutes into baking, remember your pie hat for the edges. You are most likely going to need to cover your edges to prevent them from burning, and anytime after around 20 minutes is when it will begin to happen. be ready with aluminium foil to cover those edges. Remove from over and transfer to a wire rack to cool for about 20 minutes. Serve warm, or let cool completely and serve at room temperature. Store at room temperature for up to 2 days. That is what the book says. I see nothing wrong with covering it and sticking it in the fridge to prolong its life.